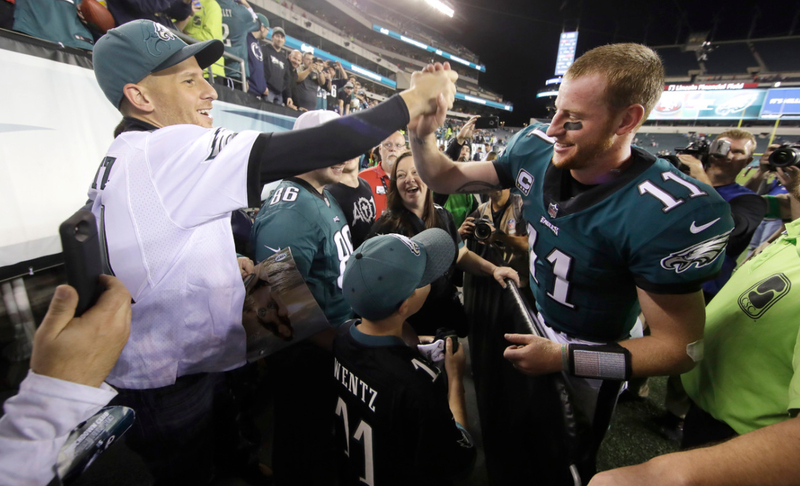 I don’t know how many (if any) of you watch NFL’s Monday Night football, but tonight, leading into the game between Washington and Philly, they had a heartwarming story about Philly’s 2nd year quarterback, Carson Wentz. A little 9 year old was suffering from stomach cancer, had been for over a year. He had a grapefruit sized mass in his stomach that needed to be removed. Carson Wentz was his favorite player. I guess a radiologist where he was getting treatment, notified the Philadelphia Eagle’s about his plight. The QB, Carson Wentz, sent over a video message to the boy, Lukas Kuster, while he was in the hospital. The boy broke down, he was so excited. A few weeks after his surgery, it was found that his cancer had returned. When his parents learned he didn’t have long to live, The Make A Wish Foundation asked Lukas if there was anywhere he wanted to go, anything he wanted to do. He didn’t want to go anywhere, he just wanted to thank Carson Wentz for the video message. Well, the Eagles and Carson Wentz did better than that. They arranged for Lukas and his family to be brought, by limousine, to the Eagles stadium/team facility. They gave them a personal tour of the facility, where he met Wentz and his favorite defensive player, Jordan Hicks. 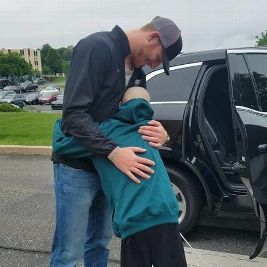 When Lukas was leaving, he gave Wentz his wristband, sporting his nickname, ‘The Dutch Destroyer’, and rose from his wheelchair to give Wentz and Hicks a hug. Lukas died 13 days after that visit to the Eagles facility. However, the connection didn’t end there. Lukas was buried in a Wentz jersey, a fact that still chokes Wentz up when he’s asked about it. And when Wentz took the field for the season opener, he did so wearing his ‘Dutch Destroyer’ bracelet, to the surprise of Lukas’ family. And Wentz has worn that bracelet during every single game since. When Lukas’ family was brought to the game tonight as guests of the Eagles, and Wentz saw them on the sidelines during warm-ups, he came over to the family, and spent over 15 minutes talking with them. This entry was posted in Carson Wentz and tagged Carson Wentz on October 24, 2017 by Silver Willow. Smiling through the tears! Great story! I was tearing up just reading this story. 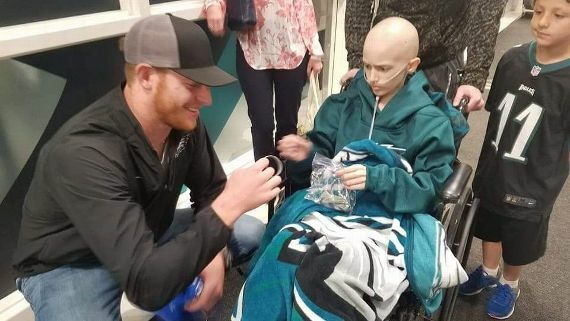 Wonderful story, it sure sounds like Lukas made an impact on Wentz as much as the other way around, it is so cool that they again brought the family in as guests of the team and that Wentz is still wearing the Dutch Destroyer bracelet. Wow, that is a wonderful story. That is a nice story to hear not just about the poor little boy with cancer but about a shining sport star. How sweet and sad. This story brought tears to my eyes. I love reading things like that — warms your heart. Wentz is from my old stomping grounds, Bismarck, North Dakota.